Benita (McGinnis) McCormick, or “Aunt Detty,” as she was known to our family, kept a scrapbook of her life and memories. She began it in the early 1970s and added to it from time to time over the years. 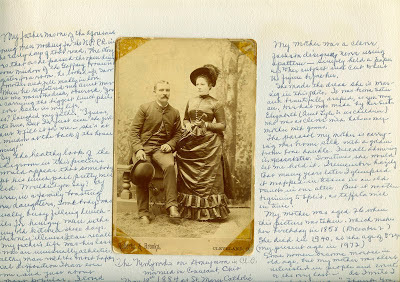 On this page, one of the earliest from her album, she attached a photograph of her parents, Thomas and Mary Jane (Gaffney) McGinnis. They were known to all simply as Tom and Janie. By the healthy look of the bridegroom in this picture, it would appear that somebody kept his lunchpail pretty well packed. Wouldn’t you say? Of course, in a family boasting four daughters, somebody was usually busy filling lunchpails for hunger men in the sunny old kitchen those days. The only illness I can recall in my father’s life was his last. He was an unusually athletic, healthy man, with the most happy and genial disposition I have ever known and just about the most popular. I loved him very much and often feel him near me. A good father is a great blessing. My mother was a clever fashion designer, never using a pattern – simply held a paper up to her subject and cut to suit the figure before her. She made the dress she is wearing in this photo. It was from satin and beautifully draped, as you may see. Her hat was made by her sister Elizabeth (Aunt Lyle to us children), who was as clever with hats as my mother was with gowns. The parasol my mother is carrying was brown silk with a golden brown bone handle. I recall admiring it. Sometimes she would let me hold it. I remember hazily that many years later I glimpsed it wrapped in tissue in an old trunk in our attic. But it was then beginning to split, as taffeta will in time. My mother was aged 26 when this picture was taken. Which makes her birthday in 1858 (December 2). She died in 1940, at the age of 82 years old (my present age in 1972). However, after comparing the above photo with the engagement portraits they had made before, Tom looks a bit older and considerably stockier than he appeared in his original photograph, no matter how well Janie may have packed his lunch pail. Janie McGinnis (the former Mary Jane Gaffney) also appears a bit older here. Was this taken in 1884 or sometime later, perhaps during a later trip to Cleveland? 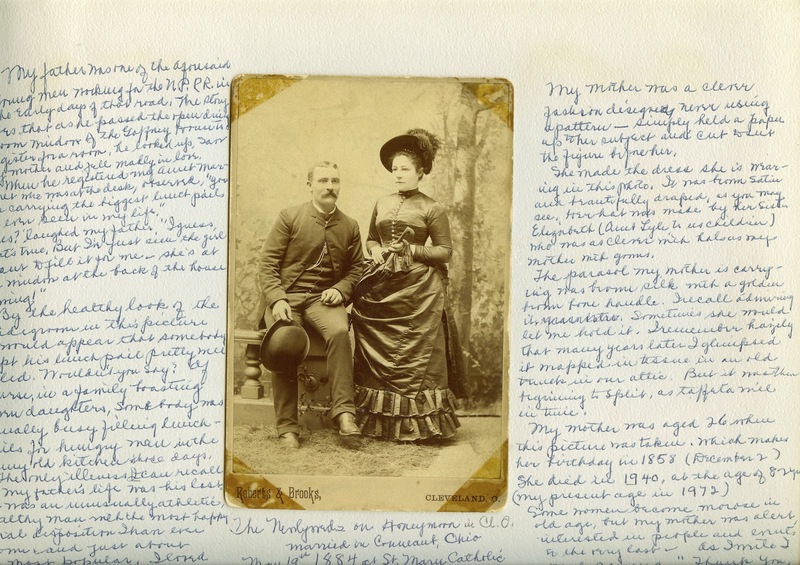 Although the cabinet card style photograph shows that they were in Cleveland wearing their wedding clothes, I would love to know why and when they were there. Did they return to Cleveland after honeymooning there, maybe for an anniversary or other special occasion? If only their pictures could tell us!